Pedestrian Accidents | Nashville Car Injury Lawyers The Law Offices of John Day, P.C. While not everyone owns or drives a car, everyone is a pedestrian. Pedestrians include people who are walking, traveling by wheelchair, pushing or being pushed in a stroller, or traveling by any other similar means. In fact, whenever you are not in a vehicle, you are a pedestrian and are potentially at risk of being involved in a pedestrian accident. According to the Center for Disease Control, over 70,000 pedestrians are injured and more than 4,000 pedestrians are killed each year in traffic accidents in the United States. That means that a pedestrian is injured every 8 minutes and killed every 2 hours. In fact, when a car accident involving a pedestrian occurs, the pedestrian is 1.5 times more likely to be killed than the passengers in the vehicle. Tennessee and the Nashville area are far from immune from this problem. In 2012, the number of pedestrians involved in reported crashes was 296 in Davidson County, 27 in Rutherford County, and 13 in Williamson County. In 2013, the numbers were 205 pedestrians in Davidson County, 28 in Rutherford County, and 12 in Williamson County. 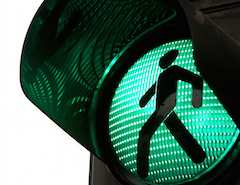 In total, in just two years 2,632 pedestrians were injured in reported crashes in Tennessee. And these numbers do not include crashes that occurred in parking lots, on private property, or that resulted in less than $400 of damage. Because pedestrians are at great risk of being hit in parking lots and driveways, neither of which would be counted in these statistics, the actual number of pedestrians injured in Tennessee is probably significantly higher than these numbers even indicate. If you or a loved one has suffered pedestrian injuries, you may be entitled to compensatory damages. Compensatory damages include economic damages such as reimbursement for medical bills incurred, payments for future medical expenses, loss of income potential, and funeral expenses. Compensatory damages also include some non-economic categories such as pain and suffering and loss of consortium. Depending on the facts of your case, you might also be entitled to recover punitive damages. Unlike compensatory damages which are intended to compensate the victim, punitive damages are meant to punish the wrongdoer. Accordingly, they are only recoverable in certain cases. If you or a loved one has been injured and you would like to discuss your case, contact us online or call us at 615-742-4880 or toll-free at 866.812.8787 for a no-cost, no-obligation consultation. We handle all pedestrian accident cases on a contingency basis, which means we only get paid if we recover money for you.